This stylish crochet poncho with sleeves is very easy because it’s made from five simple rectangles. Get the free pattern below or purchase the ad-free, printable PDF for $2.99 here. Watch the step-by-step video tutorial for extra help. This post is part of a collaboration with Lion Brand Yarn. This post contains affiliate links. If you can crochet a basic rectangle, you can make this easy crochet poncho with sleeves! 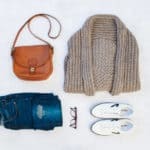 With no increasing or decreasing, you can create a cozy, sweater-style poncho that flatters all types of bodies. Read all the pattern and yarn details below, or keep scrolling for the free written poncho pattern. 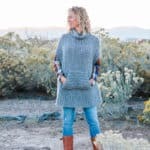 How to Crochet A Poncho? We’ve shared a few free crochet poncho patterns over the years and they’ve all been quite easy in construction. I’m especially happy with this crochet poncho with sleeves my mom and I designed together though because it has the look of a more sophisticated sweater, but the construction is as simple as making some large crochet washcloths and joining them together. 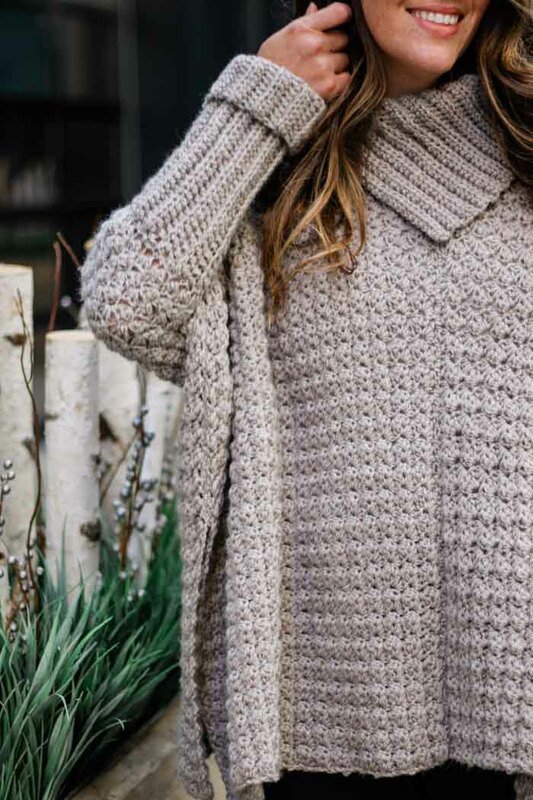 For this easy crochet poncho with sleeves, we knew we needed a yarn that had beautiful drape, came with a lot of yardage and included a bit of luxury so you’d enjoy it for a long time. Lion Brand’s Touch of Alpaca yarn immediately came to mind and and it worked so well. Touch of Alpaca is a worsted-weight yarn from Lion Brand that comes in two sizes–a 3.5 oz skein and a larger 7 oz “Bonus Bundle” size. 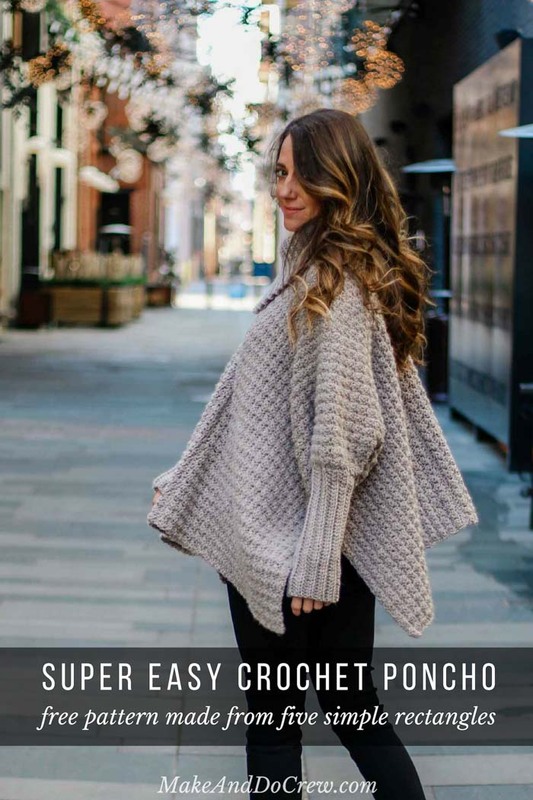 The free crochet poncho pattern below lists the Bonus Bundle size as you can get more yardage for your dollar with this larger size. If you only have access to the smaller skeins though, just know you’ll need twice the number the pattern lists. In either case, Touch of Alpaca yarn comes in a wonderful, sophisticated palette of colors that I think you’ll love. You can check them all out here. 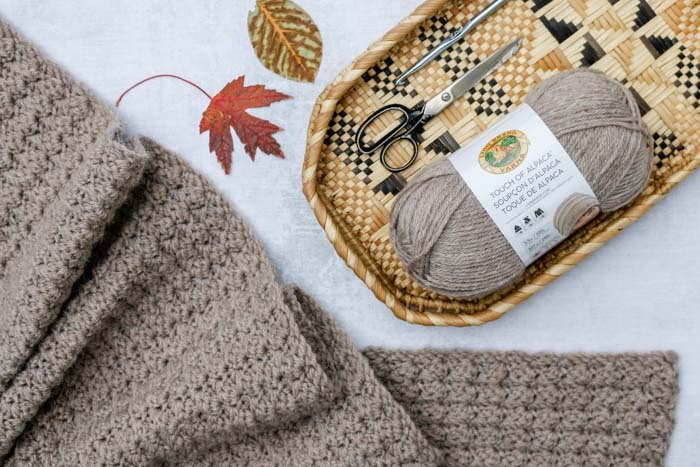 And if you’d like to see what else we’ve made in this yarn, check out the free Greyscale Poncho pattern and the At First Blush Triangle Scarf + video tutorial. 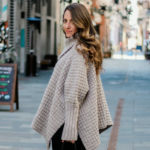 While as written this free crochet poncho pattern includes sleeves and an oversized collar, there are lots of ways to customize it to suite your personal style. • Eliminate the sleeves for a more traditional poncho look. I personally really love finding ways to transform simple shapes into stylish crochet sweaters. 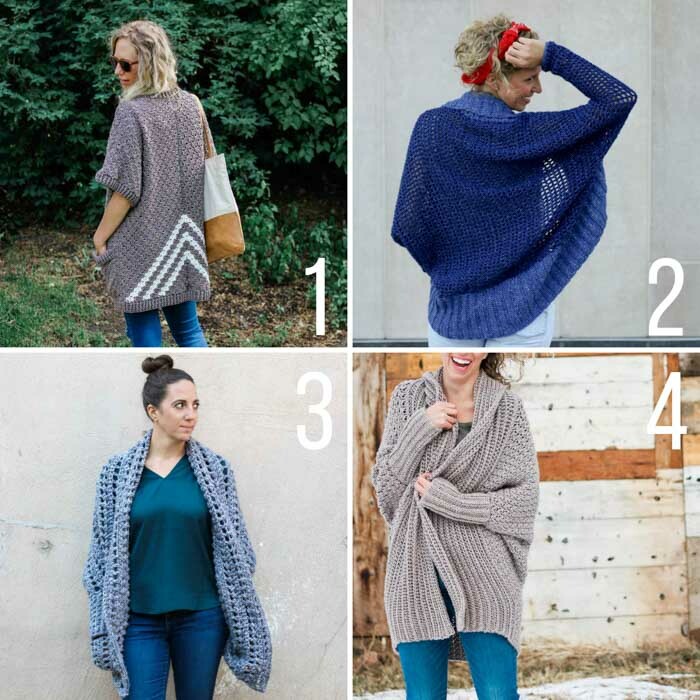 Each of these free crochet sweater patterns uses rectangles as its foundation, which means there’s no increasing or decreasing! Purchase the ad-free, printable PDF with stitch chart here. 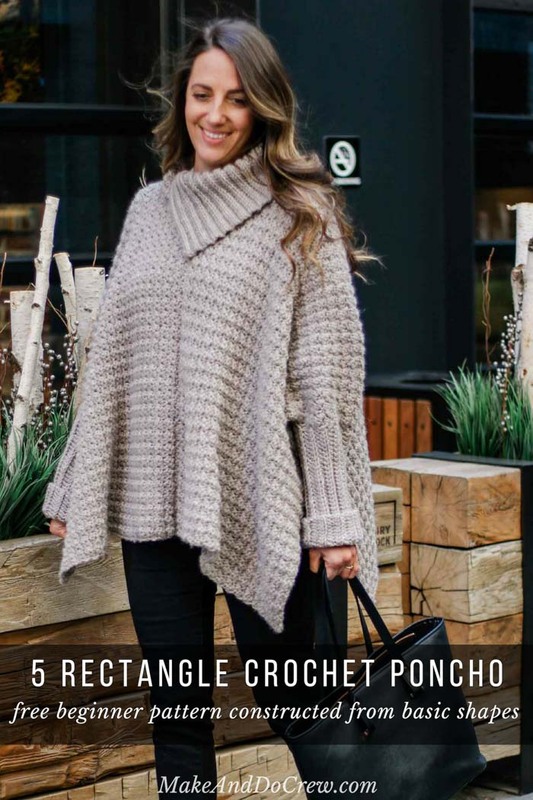 Take advantage of some simple crochet geometry to turn five basic rectangles into a stunning, cold weather poncho. The deceptively easy sleeves will keep you cozy and give this garment a polished, sweater-like vibe. 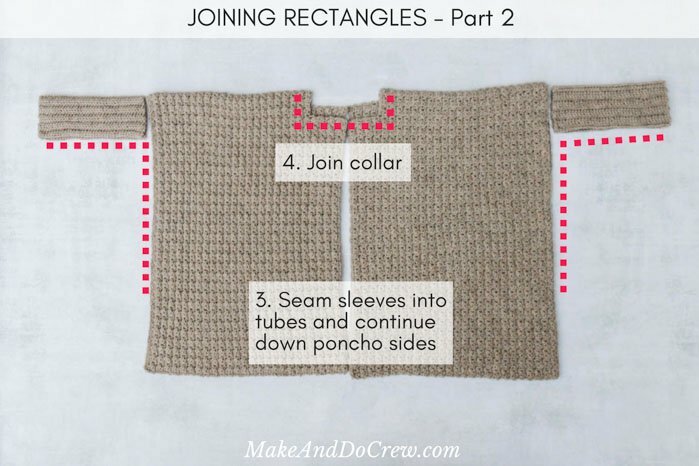 You’ll begin by making two identical rectangles using a simple, but eye-catching stitch pattern. Next you’ll make three more rectangles using crochet ribbing that will become the collar and two sleeves. 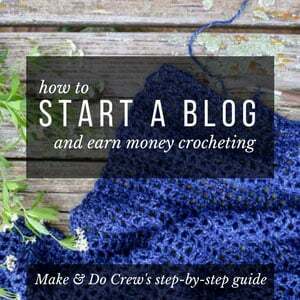 Because the entire garment is made without increasing or decreasing, the skills required are quite beginner-friendly and include single crochet, half double crochet, double crochet and seaming. Watch the step-by-step video tutorial here. Sample is a M/L pictured on a 5’8” model with a 38” bust. Poncho has a generous 42” of ease. • If you’re a visual learner, investing a few dollars in the ad-free, printable PDF will be very helpful because it includes a stitch chart for the main rectangle pieces. • Poncho is constructed from five rectangles. Left front and back of poncho are worked at the same time, as are the right front and back. • Watch the step-by-step Alpine Poncho video tutorial here. • Right front and back of poncho and left front and back are worked identically. • A horizontal “cluster” = 1 sc, 1 hdc, 1 dc. Vertically, 2 rows equal a complete cluster. Row 2 (WS): Ch 1 (counts as 1 sc), work [hdc, dc] in first st, *sk [1 dc, 1 hdc], work [sc, hdc, dc] in next sc; rep from * until 3 sts remain, sk [1 dc, 1 hdc], sc in top of tch; turn. Rep Row 2 another 48 (50, 52, 54) more times for a total of 50 (52, 54, 56) rows. [This will look like 25 (26, 27, 28) vertical clusters.] End with a WS row. Do not fasten off. • The ad-free, printable PDF contains a stitch chart that illustrates the neckline in detail. If you’re struggling to understand any part of skipping clusters to create the neckline, consider purchasing the PDF. From here, all remaining rows are worked over these 26 (27, 27, 28) horizontal clusters. Rep Row 2 another 7 (8, 9, 10) more times for a total of 59 (62, 65, 68) rows from Foundation Row. [This will look like 29.5 (31, 32.5, 34) vertical clusters.] Fasten off leaving a 35” tail. With RS facing, sk 4 (4, 6, 6) horizontal clusters to create neck space. Attach yarn in sc of 5th (5th, 7th, 7th) unused sc from “Front” indent edge. From here, all remaining rows are worked over these 27 (28, 28, 29) horizontal clusters. Final rectangle (including the additional rows for the neckline) should measure approx. 51.75 (53.25, 54.75, 56.25)” x 19.25 (20.25, 21.25, 22.25)”. • Sleeve rectangles are worked lengthwise. To shorten or lengthen sleeve, adjust number of chains in Foundation Row. • For a tighter sleeve, work fewer total rows. For a looser sleeve, work more rows. In both cases, take care to work an even number of rows total. Note that adjusting sleeve in this way will impact the amount of room you want to leave open for armhole when you seam main poncho pieces together. • Ribbed look is created by working through the back loop only of each hdc stitch. This is the loop that’s farthest away from you, regardless of whether the WS or RS of work is facing you. • Ch 2 at beginning of row does not count as a hdc. Rep Row 2 another 18 (20, 22, 22) more times for a total of 20 (22, 24, 24) rows. [This will look like 10 (11, 12, 12) ridges of ribbing.] Fasten off leaving a 25” tail. • Collar rectangle is worked horizontally. To shorten or lengthen height of collar, adjust number of chains in Foundation Row. • Like with sleeves, the ribbed look is created by working through the back loop only of each hdc stitch. This is the loop that’s farthest away from you, regardless of whether the WS or RS of work is facing you. Rep Row 2 another 49 (53, 66, 70) more times for a total of 51 (55, 68, 72) rows. [This will look like 25.5 (27.5, 34, 36) ridges of ribbing.] Fasten off leaving a 30” tail. • To minimize the number of ends to weave in, use leftover tails from fastening off to seam whenever possible. Lay two main pieces so that the fronts and backs are aligned. Since RS and WS are identical, choose which you prefer and designate it the RS. Note that the back has one extra st (cluster) than the front, so take care to have both back sides aligned with each other. With WS of each piece facing out, pin if desired. Using the zig zag stitch, begin at bottom of Front and seam toward Neck (see photo below). Take care to line up visual clusters while seaming. Fasten off at neck opening. With WS still facing out, repeat the same process to seam Backs beginning at bottom and working toward Neck. With WS facing out, fold poncho in half so bottom of Front and Back are lined up. PM at outside edge of shoulder crease on both Left and Right sides to denote top of shoulder. Counting from shoulder marker down, skip 4 (4, 5, 5) clusters then PM in next cluster on both Front and Back. [There are therefore 8 (8, 10, 10) total clusters between markers. This marks the sleeve opening.] Repeat on opposite side. Note: The number of clusters skipped will vary if you added or eliminated rows to adjust looseness of sleeve. Fold sleeve in half along ribbing. PM at mid-point to mark point of ribbing that’s half way from Foundation Row and final row. Repeat with second sleeve. Lay poncho out flat as pictured in photo above. Pin sleeve to poncho by first aligning sleeve marker with shoulder marker. Next, stretch sleeve a bit so edges reach markers on poncho Front and Back. Repeat with second sleeve. 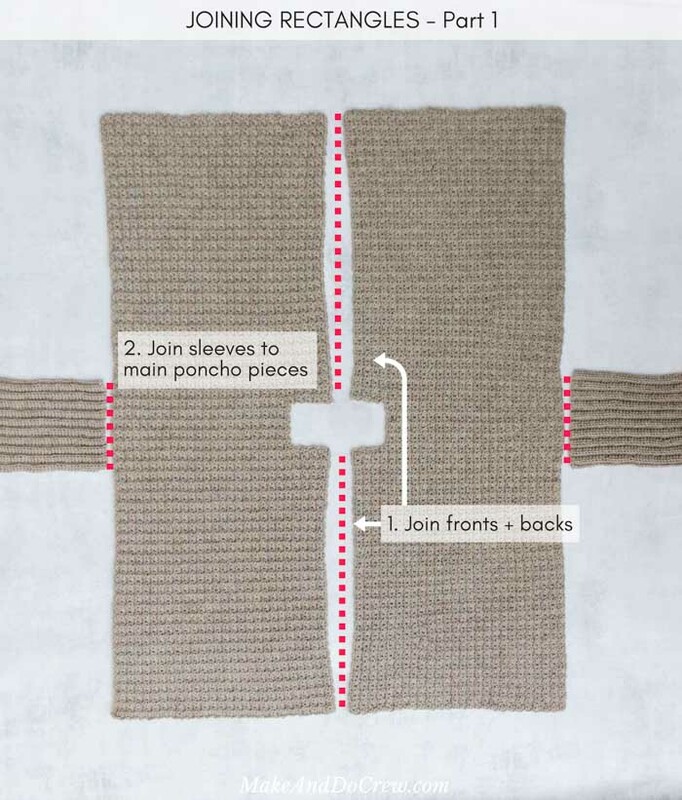 With WS of poncho facing out, seam each sleeve rectangle in place. With WS of poncho still facing out, fold in half so bottom of Front and Back line up. Beginning at bottom (wrist) of sleeve, seam sleeve tube together. Continue seaming along side opening of poncho until 10 (11, 11, 12) clusters are joined. Leave the rest of side seam open and fasten off. See photo below. Repeat on opposite side. Turn poncho RS out and weave in any remaining ends. With RS of poncho and RS of collar facing each other, pin collar in place. Collar should begin in 4th (4th, 6th, 6th) cluster to the left of middle seam, wrap around neck and end with approx. 3” of overlap. Seam in place, see photo above. 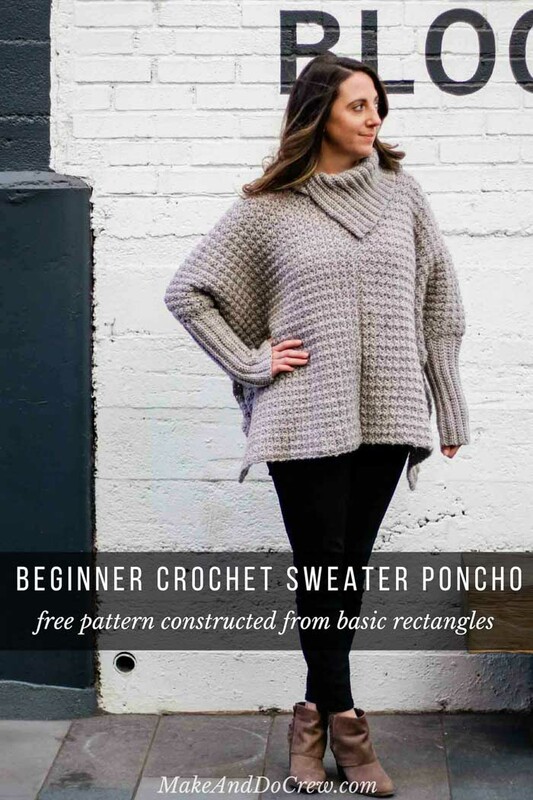 Now that you’re a master of crochet geometry, pull on your new poncho and hit the town in style! 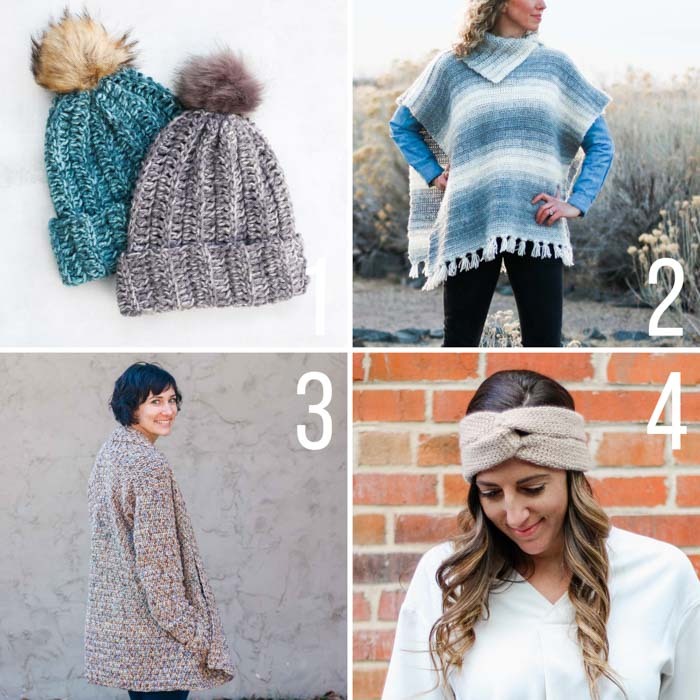 Now that you’re on a roll, you might enjoy these other super easy free crochet patterns from Make & Do Crew. Each pattern is approachable for beginner to advanced-beginner crocheters. You can always find all our free crochet patterns here. 2. Braided Poncho – Simple, knit-look crochet poncho pattern with fringe. 3. Up North Cardigan – Simple four-season cotton cardigan with video tutorial. This is beautiful! I can’t wait to make it! Thanks Grace! My mom and I were both really happy with how it turned out. Hello Jess!! Love your patterns, and your book!!! Long time listener, first time caller here. I don’t have LB Touch of Alpaca yarn in my local stores, and I refuse to order off their website because every time I do, there’s an issue. I do have, however, a million skeins of RH Hygge yarn that I need to do something with. It’s slightly bulkier, but not by much, and it’s super soft. Do you think this would be a good alternative?? Thanks, and congratulations on the baby!! I love all of your patterns, my first cardigan was your Staycation and I had never made anything but baby blankets before. Thanks for all of the tutorials and patterns! This is a must make for me!! This is amazing!! I’ve always wanted a poncho but with sleeves!! Thank you so much for sharing!! Thank you so much! My mom and I were pretty unsure about this one at points along the way, but we both loved how it turned out in the end too. This is gorgeous! Can you please tell me how to adjust for length? I’m interested in making the M/L but would like it a bit longer. Thank you for all of these beautiful patterns and Happy New Year!! So the stitch count for the main rectangles just needs to be a multiple of 3. So you can chain more stitches in the foundation and you’ll end up with a longer poncho overall. For the neck, I think you could skip the same number of clusters as the pattern lists, so you’ll just want to basically divide your total number of clusters by 2 so that you can place the neck in the center. Thank you for this! I your patterns! Thanks so much! I hope you enjoy this one. Oh how l love your creations. I have been waiting patiently for sleeves In a poncho for years finally you have given me this gourgeous poncho. I can’t wait to begin and keep me warm.. Thank you so much. Me too, Darlene! Ever poncho I’ve made, I’ve always wished it had sleeves. This pattern is beautiful and I am excited to make it! I just had a question about how many skeins of yarn are actually needed. You mention using the Touch of Alpaca Bonus Bundle which has 415 yards. Then for the small size, you mention needing 6 skeins (2490 yards) but it looks like the pattern only ends up using 1140 yards. Am I correct in thinking it would be 3 of the Bonus Bundle size or 6 of the regular size yarn skein. Thank you! Yeah, good question. The 1140 is actually the grams needed. So you’ll need 6 of the bonus bundle size to make the small. Hope that makes sense. Love this pattern and wish I had the urge to crochet but maybe later on…. I’ve been looking for a poncho like this one! It is seriously so cute. The shape of it is so much more flattering than so many others I’ve seen. I agree, ponchos always seem hit or miss in how they drape on a person. I’m so glad you like this one! I love this pattern. Thank you for sharing. I am very petite so how can I make it smaller? I love your patterns. I’m just wondering how to make this smaller as I’m pretty petite. Thank you! 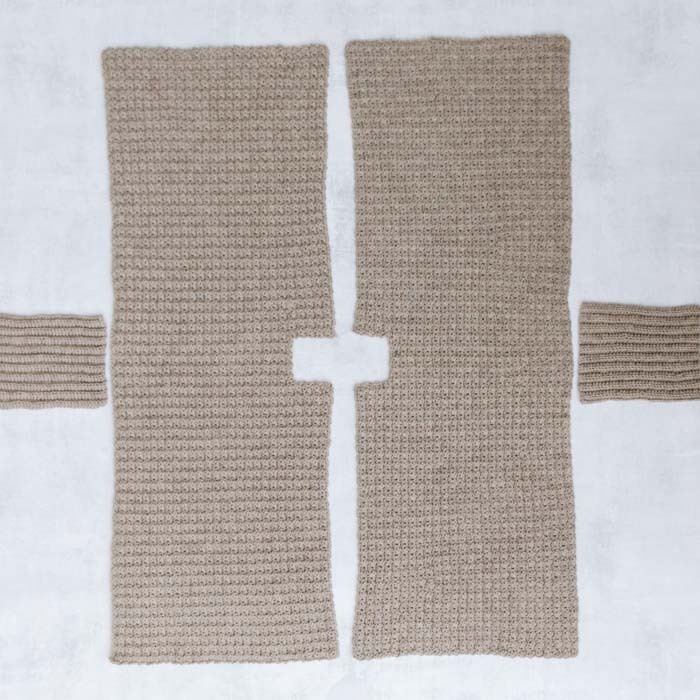 You can adjust the size of each main rectangle to make it a bit smaller and that will make the overall sweater smaller. If you do that, just begin with an initial chain that’s a multiple of 3. You might also want to make your sleeves a bit shorter by just starting with a shorter beginning chain as well. Looking forward to making this pattern. I love the design and the fact that it has sleeves. Can not decide on what color….maybe something gray or brown. I started this the other day, got 3 skiens in and realized the size is way off! The starting chain makes this way over 40 inches. I even frogged all 3 skiens back to the beginning and measured my new starting chain. Again it measures over 40 inches. Closer to 50. Oh that sounds really cute! I’d love to see a pic when you finish if you’d like to email me or tag me on Instagram (@makeanddocrew)! Love your patterns! Do you have a video for this? Yes! You can find the video tutorial for the Alpine Poncho here. This is lovely!! Instructions are easy to follow. Thank you so much for sharing your patterns..